On Friday, February 7, 2014, the jury in the NATO 3 trial returned its verdicts against Brent Betterly, Jared Chase, and Brian Jacob Church. These three had been held in Cook County Jail in Chicago since they were arrested on May 16, 2012. They faced trumped up, politically motivated terrorism, conspiracy, and arson charges because of their perceived politics and political activities (mostly through the Occupy movement). The cops and prosecutors had demonized them from the beginning as violent anarchists and domestic terrorists who needed to be locked away for decades because of their nefarious intents to terrorize the city of Chicago. We knew all along that they had been targeted as part of a broad campaign of state repression against activists, particularly anarchists. We knew all along that they had been singled out to send a message to us all that any dissent will be severely punished, that any step outside of the bounds of the mainstream power structures will be met with fierce consequences. The jury did not buy the state’s lies about our comrades being terrorists. 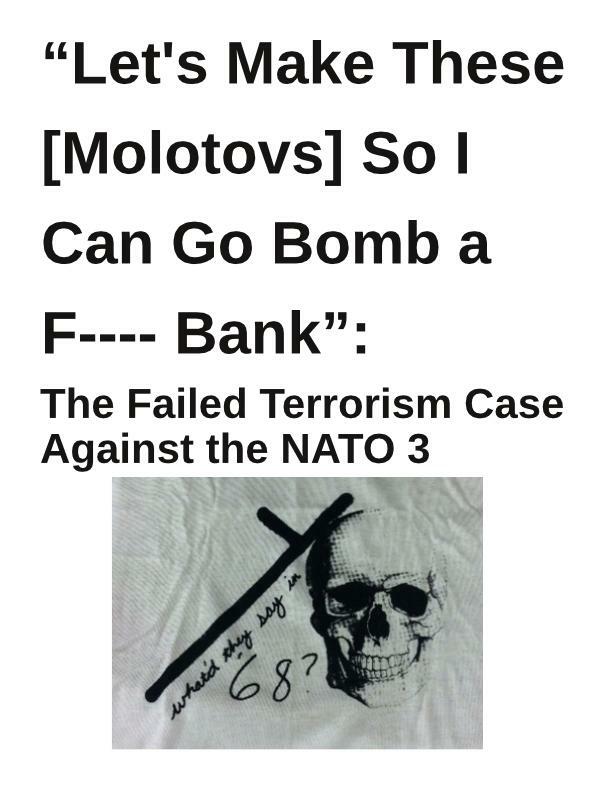 They acquitted the NATO 3 of all the terrorism charges: conspiracy to commit terrorism, material support for terrorism, possession of an incendiary device with the intent to commit terrorism, possession of an incendiary device with the knowledge that someone else intended to commit terrorism. They also acquitted them of the solicitation to commit arson charge. Yet the jury played its role in the criminal legal system by finding them all guilty of possession of an incendiary device with the intent to commit arson and possession of an incendiary device with the knowledge that another intended to commit arson. They also found them all guilty of mob action, a lower-level crime that was offered to the jury as an alternative to the conspiracy to commit terrorism and material support for terrorism charges. The possession charges carry a maximum sentence of 30 years in prison. We can celebrate the victory over the state’s worst lies and their defeat on their own battlefield, but we must not forget that these three individuals are still being made to pay the price for our resistance. We do not know how long they will continue to be held captive by our enemies, but we do know that we will continue to stand in solidarity with them and fight for their freedom until each of them walk out of the prison gate. The NATO 3 will be sentenced on Friday, February 28 at 2pm. We will send word in the near future about ways you can show your solidarity for them, so stay tuned. In the meantime, we are asking for donations for their support needs in case they will be kept from us for many years to come. They also need to hear from comrades around the world that they are not alone! LIKE US – WE LIKE YOU! Stay up-to-date on the NATO 3 case! Email nato-3-announce-subscribe@lists.riseup.net!